Nestled into the Newport Dunes and with sweeping views across the marina, the Back Bay Bistro is a relaxed waterfront restaurant that transforms into a stunning wedding reception venue. Their 15-foot high panoramic windows and retractable roof make you feel like you are dining in the outdoors, while the warmth and elegance of the interior features are undeniably comforting and elegant. 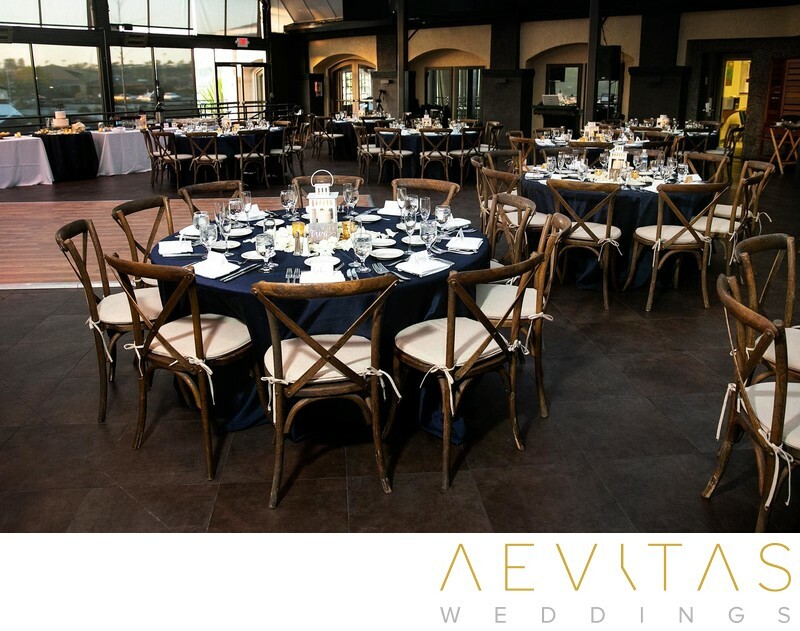 You can select between their Dockside or Harborside dining rooms, both suited to more intimate reception events, and enjoy their American-inspired cuisine and delectable seafood dishes. While all catering is taken care of by their expert chefs and catering team, there is the option to BYO drinks if you prefer to add a distinctly personal touch to your reception menu. Apart from an excellent reputation for their catering, the Back Bay Bistro’s location is one of its star attractions, with the docks right outside and the sunsets magnificent. Watch as luxury yachts cruise past and take the opportunity for a couple portrait session during the magical golden hour. This waterfront setting is also the perfect excuse to step outside during your reception for a nighttime portrait shoot with the moon reflecting off the waters of Newport Bay. There are few venues in Southern California that can boast a retractable roof and treating your guests to a lavish meal under the stars will be one that they never forget. The restaurant staff at the Back Bay Bistro are experienced in managing indulgent wedding events and will ensure that every member of your wedding party is taken care of throughout the evening. The Back Bay Bistro’s decor has a casual elegance about it and you can customize the space with your own floral decorations and sentimental touches to create a wedding reception that reflects your individual tastes. For couples looking for a wedding reception that combines a stunning waterfront setting with highly-reputable cuisine, the Back Bay Bistro is one of Southern California’s lesser-known gems.